It’s not a surprise when cold and flu season strike once a year with aches, pains and bodily misery. However, something even more virulent has the ability to make us ill year-round: stress. I know a bit about the link between stress and illness first hand. Four years ago, I set out to regenerate a career that had stalled after the birth of my first (and only) child. I said yes to every work opportunity and then some, becoming so overloaded I had to write lists on an hourly basis just to keep everything straight. I traded in wellness and sleep for achievement and a paycheck. It all came to a head when, despite a sore throat and aches that lasted off and on for a solid week, I drove six hours to speak at a weekend writing conference where I was “on” for two days straight. Within days of coming home, I developed Scarlet Fever (a strep infection you usually only see in kids, and rarely at that). I was bed ridden and in agony, sicker than I had been since childhood. Once I finally recovered, I wondered: Could my stress have made me sick? A large body of research says yes, absolutely. This is particularly true for chronic stress — that which recurs and persists over time. 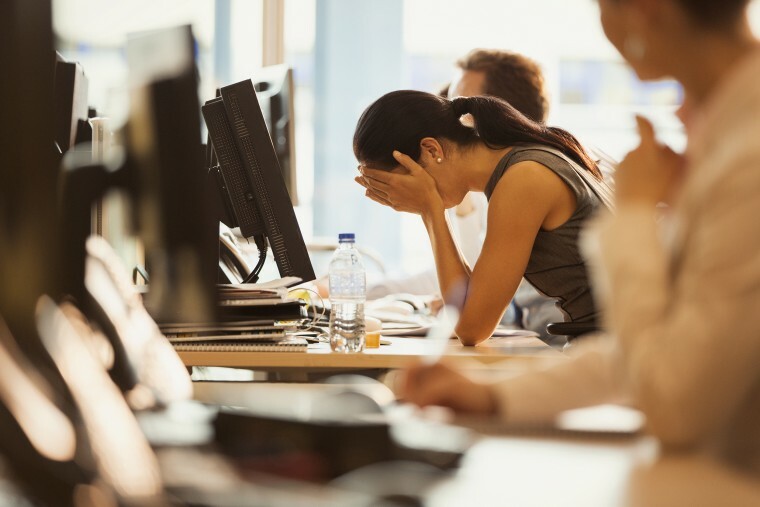 Chronic stress can range from a traumatic event that has long-lasting consequences (an accident, the loss of a loved one) to a toxic workplace where demands are high and rewards are low. Like anything good, too much of an immune response can be a bad thing. Figuring out just how we go from stressed to sick on the physiological level is the subject of a new study published in the Journal of Leukocyte Biology. The key, according to this study, can be found in the way our immune systems interact with our nervous systems. While the immune system is great at defending against microscopic bugs, “fight or flight is not going to help me sift through all of those emails and feel bad about returning them late,” lead study author Adam Moeser told me. These cells are among the first to be activated not only in the case of infection, but also to “any perceived threat,” even one psychological in nature. In other words, they act as “alarm cells” in the body, responding within seconds to the onset or exposure to stress. Like anything good, too much of an immune response can be a bad thing. Mast cells are important immune defense barrier on the one hand, but when the stress response becomes “too overwhelming, where we can’t cope or return to our homeostatic place," Moeser said. "The mast cells switch from being protective to actually pathogenic." Too many overactive mast cells are indicated in irritable bowel syndrome (IBS) and asthma, but they are often just the tip of an immune cascade. What was once a helper becomes a hindrance, leading to increased inflammation. Mast cells trigger the release of histamines (causing itching and swelling), encourage mucus production and produce pain by acting on sensory nerves in the body that signal the brain to amp up your pain response. To better understand this process, Moeser’s team homed in on a specific type of stress receptor that lives on the mast cell, known as CRF1 (corticotropin-releasing factor receptor subtype 1). This receptor releases a substance when it perceives stress — which could be a sudden meeting with your boss or an actual pathogen. Researchers modified these receptors in mice and in human mast cells (grown in petri dishes) in order to measure their response to different types of stressors, including psychological and immunological stress. When the receptor numbers were reduced, the mast cells’ activity during stress was also reduced, leading to “less disease outcomes in the physiology,” Moeser said. It took serious illness to remind me no amount of achievement or money is worth losing one's health. Cut to me, four years ago, lying in a fetal ball of agony with Scarlet Fever, which I had dubbed “the virus of the seven plagues”— sore throat, high fever, nausea and vomiting, swollen joints, the tell-tale red rash and a horrible swollen, white, bumpy tongue called “strawberry tongue.” I had suspected my stress level was unhealthy and unsustainable, but it took a serious illness to remind me that no amount of achievement or money is worth losing one's health. Our bodies were designed to fight big predators and tiny pathogens, not deal with nitpicky coworkers and work deadlines. We may not even perceive these kinds of stressors as stress until our mast cells have already set off a chain reaction of stress reactions that prime us for illness and disease. Moeser hopes that his research will enable researchers to find a drug or therapy that could block the CRF1 receptors and therefore help tamp down this overactive stress response. In the meantime, we should keep ourselves in fighting shape by practicing all the good habits of self-care: getting enough rest, good nutrition, taking breaks, and restorative activities. Your email can wait.